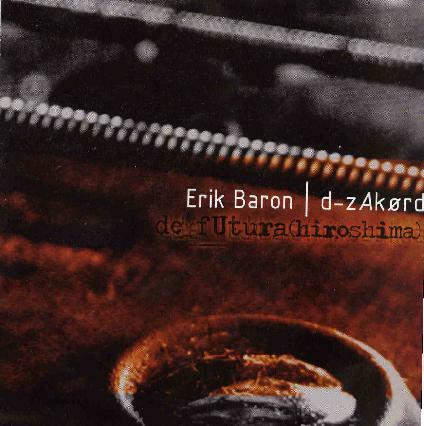 This is a very special CD arranged by Erik Baron, but originally the pieces were composed by Magma bassist Jannick Top. 6 bass players and 6 guitar players take place in creating this very adventurous CD. Only one drummer (Thierry Jardinier). The first piece is a short 3 minute piece with violin like guitars and a very dark feel. This leads into La Misique des Sphéres. There is a lot of looping a real spaciness and a bit of industrial drones as the band tries to create the music for Top’s myth about the people of Ork, a race trying to fight against overwhelming machines! De Futura #1 is a 13 minute piece starting off with just drums before the guitars (Fripp like) kick in and some really cool bass parts as well. Here the music becomes a bit symphonic like and the Magma influence is heard. Later the track becomes very dark and heavy. Le Drone du Milieu is 4½ minutes and like the title is a laid back spacey drone piece before the 15½ minute De Futura #2. It starts slowly with mostly just bass and some percussion but then really picks up speed. No real guitar solos just a lot of intense repetitive riffing and emotions. Intense stuff… The CD ends with De Profundis, another short spacey dark drone number. Pretty amazing CD. I loved it!